I have long felt a sense of outrage that mining companies can invade farmland to tap coal seam gas regardless of the wishes or concerns of the landowner. Accessing this gas usually involves a process called fracking (hydraulic fracturing), where a chemical cocktail combined with sand and water is applied under very high pressure to shale rock, to create new channels to release their petro-chemical components. There are over twenty chemicals involved in the fracking cocktail, some of which have not been identified by the patent holder and some of which are known to be hazardous. There is an obvious and undeniable risk of contaminating underground water sources – the film Gasland chronicles the scale of this contamination in the US. There have already been examples in Australia where the bore water has become flammable and toxic, and yet there has been no way to halt the invasion. Vast areas of Australia have been earmarked for gas wells and, like the GMO rush, there has been very little safety research and a great deal of spin relating to the corporate push to industrialise our countryside. During the Christmas/New Year period I camped at the Woodford Folk Festival for seven days. This is an amazing celebration of music, art, comedy, poetry, ideas and multiculturalism. It is set on a 700-acre site and the 2400 performers attract crowds of over 130,000 over the six-day festival. I was booked to speak at the Greenhouse venue, a haven for activists trying to protect our heritage and promote viable alternatives to the extraction mentality that is proving so unsustainable. I sat in on many high-quality talks during the week, but I was particularly impressed and moved by the presentation of the founder of the “Lock the Gate” movement, Drew Hutton. Drew Hutton is a college lecturer who decided to take a stand. He recognised that the peaceful protests that had proven so effective for Gandhi, when ousting the British from India, had never actually been replicated in modern times. This became the model when he hit the road and conducted meetings amongst multiple farming communities. He was able to successfully forge an alliance of farmers, concerned environmentalists, academics, students and city people. In fact, the Lock the Gate Alliance represents a rapidly growing community-based resistance that is shaping up to be the biggest and most successful social movement in Australian history. The community involved seeks widespread support and then produces a document that states their position and intent to resist any attempt by the mining companies to invade their region. The gates are locked both literally and figuratively as the regions stand up to protect themselves in the absence of any form of Government support. Recently, the focus has expanded to include country towns impacted by proposed coal mines. Over the course of the week I heard presentations from doctors working in coal towns who talked about multiple health problems related to mining. They also presented compelling research quantifying the danger of the fine particle emissions that are an integral part of having a coal mine as a neighbour. The contamination is undeniable and quite horrifying, and it is almost inconceivable to imagine how governments could possibly allow these kinds of developments near settlements, in the face of this kind of evidence. I have been suggesting for years that we have reached a time in our history where we must reclaim responsibility for our own health, as no one else is going to do it for us. This example of Government apathy is a prime example of why we need to look after ourselves. The Lock the Gate Alliance is a wonderful example of just how effectively we can reclaim that control. I am keen for the Nutrition Farming Network (NFN) to align themselves to these brave souls and to offer any possible support. What do you think? The resistance to fracking and new coal mines is not just about protecting our soils, waterways and communities, it is also about protecting our planet against the ravages of climate change. The IPCC have recently provided the science which supports the urgent need to adopt a carbon budget. This comprehensive research suggests that we can access just 20% of all the known coal and oil reserves between now and 2030 or we will have created an irreversible situation where our climate becomes increasing unpleasant. This means that 80% of known reserves simply must stay in the ground. Why on earth would we be opening huge new coal reserves and who on earth voted for Clive Palmer? Australians are already the largest CO2 producers per capita on the planet, without allowing for the fact that we are also the largest suppliers of coal. When confronted with this fact our politicians and people simply brush it off by suggesting that what happens to the coal we sell is not our responsibility. Isn’t this exactly equivalent to the heroin dealer who rationalises his profession with the identical argument? Most people are simply not aware of just how serious the climate change issue has become. However, when you know the facts, it is hard not to agree with the words of Professor Ian Lowe, who recently suggested that we all need to become activists at this point in time or we are simply dead at the wheel. There is no place for apathy when the threat is so imminent. One of the co-founders of the Permaculture movement, David Holmgren, has just published an article entitled ‘Crash on Demand’, where he has made the unprecedented suggestion that the only way to save the day might be to strategically crash the fragile economy and sponsor a depression, which may slow things down long enough for us to survive. He suggests that, if just ten percent of us withdrew from the banking system, this could be sufficient to spark the necessary crash. This is a huge gamble on David’s behalf. Permaculture is arguably Australia’s greatest intellectual export and yet David is brave enough to risk damaging his hard won credibility by being branded an “economic terrorist”. What new information has prompted this pioneer to even consider such a gamble? David has acknowledged that he has been influenced by Canadian economist, Nicole Foss, in recognising that a crash is imminent and unavoidable at some point soon. However, he is also aware that the much-needed slowdown may not occur in time to make a difference. Renowned climate change scientist, James Hansen, has suggested that we have just four years to make major changes or we may find ourselves in an irreversible tailspin. However, it is events that are currently unfolding in the arctic that are most serious and may have contributed to the ‘Crash on Demand’ suggestion. There have been some concerning reports from scientists working in the arctic region. It is now predicted that, by 2017, there will be no Arctic ice in summer for the first time in three million years. Arctic oceans, lacking reflectivity from the normal ice cover (the albedo effect), will warm far more rapidly. As the ocean heats to greater depths, there is a high likelihood that this will trigger the release of methane from mountains of sludge beneath the ocean, called methane hydrates. This massive source of methane remains stable in the cool temperatures that are found at depths of 500 metres or more. The ocean is beginning to heat at these depths. This season, in the Arctic region, scientists are reporting methane vents up to 150 km long, where the ocean is bubbling as far as the eye can see. The July edition of the prestigious and highly credible Nature magazine reported the increased likelihood of a 50 gigatonne burp of methane from this region. Methane has 23 times more thickening effect on the blanket of greenhouse gases than CO2. This potential “burp” will be equivalent to more than 1000 gigatonnes of CO2 in one massive release. This is four times the amount of CO2 released by mankind through all industrial enterprises since 1860, and twice that which has emanated from our soils since the advent of agriculture. In this instance, the rapid acceleration of climate change is inevitable. 250 million years ago, a methane-fuelled extinction resulted in the loss of 95% of all species on the planet. We are now in the midst of the sixth mass extinction and it is happening more rapidly as a result of climate change. We are currently losing 150 to 200 species every single day! How do we fast track a turnaround? I think you may now have a concept of the urgency of this issue and may well be thinking about either “switching off” due to the enormity of the situation or wondering how you can contribute to the necessary change. Please choose action over apathy. The Lock The Gate Alliance is demonstrating the positive results that can be achieved when we work together with intent and determination. We are the change we have been waiting for. I have written and spoken at length about the importance of humus in the planet saving equation, but there is another strategy that is critically important. When the need for change is so desperate, it is idealistic to think that we can rapidly reverse the system that created the nightmare. It makes much more sense to steer that system in the right direction, and this simply comes down to money. If there is more money to be made from doing the right thing, then there will be rapid change. I saw a fine example of this phenomenon during my recent visit to Germany. In that country, Angela Merkel had been a strong proponent of nuclear power, but she had an admirable about turn in the face of the Fukushima debacle. The simple technique to sponsor a rapid move away from nuclear power was to make it more profitable to produce power from the wind, the sun and biogas generation. There was a law passed enforcing power companies to purchase all power produced from sustainable, renewable sources and the prices were regulated to encourage this form of energy production. The price for nuclear power was fixed at 6 Euro cents per unit while the price for solar and wind power was set at 8 Euro cents. Biogas power was set at 10 Euro cents and production exploded. 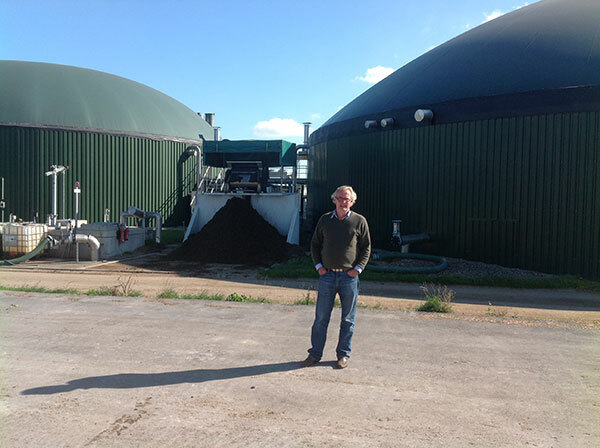 There are now many thousands of Biogas plants across Germany and I saw some big smiles on the faces of farmers involved. Here is why they were happy. I visited one biogas plant on a farm owned by the head of the German Farmers’ Association, Dr Heinrich Graf Von Bassewitz. He explained the economics of the investment. His plant had cost 1.5 million Euro to commission. It comprised two large tanks and a generator, and was fully computerised. The power is generated by methane gas, which, in turn, is sourced by the accelerated breakdown of organic matter under anaerobic conditions. This power is supplied back to the grid. He referred to the system as his “iron cow“, because bovine digestion also generates methane. It involves just two hours of labour a day to keep the iron cow fed. Heinrich allocates 700 acres from his 3000 acres to grow the organic matter required to feed the system. He has found that clover works just as well as maize as a fermenting base, so he uses the production fields as a two-year legume rotation in his cropping system. The clover is harvested, wet down and covered by black plastic to create anaerobic conditions similar to simple silage production. This partly fermented organic matter is fed into the machine with a front loader on a daily basis, where the anaerobic process is accelerated. The carbon within the organic matter is used in the production of methane but the rich mineral load contained within the thousands of tonnes of clover or corn is separated off into the second of the two tanks. The system produces 770,000 litres of this mineral-rich liquid per year, which is applied as a fertiliser to the whole farm. Heinrich is an organic producer and was greatly concerned that the loss of carbon from 700 acres would deplete his organic matter. However, he commissioned a university study, which showed that this is not the case. When this huge amount of liquid fertiliser is added back to the system it sponsors an increase in chlorophyll production, which, of course, means an increase in photosynthesis. Humus in the soil largely comes from photosynthesis, so the extra glucose (carbon) produced more than compensated for that lost during methane production. What an amazing system – but wait until you hear the economics. Heinrich is paid 1.2 million Euro for the power he generates and he saves a further 100,000 Euro from the methane he uses to heat the group of houses on the farm each winter. He has also gained 770,000 litres of liquid fertiliser. If you priced that at one Euro per litre, you have reclaimed a total of almost 1.4 million Euro on an initial investment of 1.5 million Euro. That’s a return of over 90% on investment. Securing finance should be no problem with these kinds of figures. Why are we not looking at this technology here, I wonder? We have reached a critical point in human history where there is no place for apathy. We must all contribute to help save the day and we must do so sooner rather than later. The Lock The Gate initiative is a movement that is incredibly important on several levels and deserves the support of every food producer and every food consumer in this country. The power of the people has been proven time and time again. In fact it is the only thing that can save the day. I would like to see our Nutrition Farming Network strongly supporting this alliance. I would like to see lobbying of politicians to make them realise that they can fast track the necessary change by incentivising the right things. I think we all need to look at simple strategies like divestment of funds from banks that are supporting the mining and unsustainable energy sector. Remember, it is all about money. If we withdraw our money, including our massive superannuation funds from those who are doing the wrong thing, then they are rapidly incentivised to change their ways. The turnaround is achievable within the limited timeframe but we must all be involved. Please let me know your thoughts.